'Start Here': Trump, Cohen, fertility rates. What you need to know to start your day. It's Friday, Jan. 11, 2019. Thanks for choosing to start here. Today the government shutdown ties the longest in U.S. history. 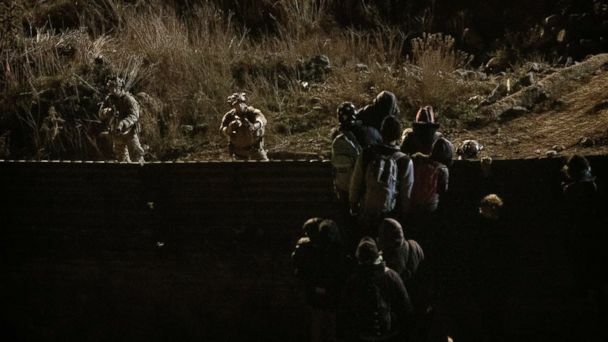 President Donald Trump is still demanding billions of dollars to build a wall along the nation's southern border, and he's inching closer to the possibility of declaring a national emergency to do so. "I haven't done it yet," he told reporters on Thursday, before heading to McAllen, Texas, to tour the border. "I may do it. If this doesn't work out, probably I will do it. I would almost say definitely." ABC News Chief National Correspondent Matt Gutman joins us from the border in Mission, Texas, and he tells us the White House already is laying the groundwork for having the military build the wall. If Trump does declare a national emergency, he may face opposition from people in his own party, according to ABC News' Trish Turner: "Even Republicans agree this is a very dicey road that you're going down if this is how you try to end a negotiation that's not going your way." Michael Cohen, the president's former attorney and fixer, has agreed to testify under oath on Capitol Hill, giving what he's called a "full and credible account of the events which have transpired." A hearing is set for Feb. 7, and there will be limitations on the questions asked so as to not interfere in Cohen's cooperation with special counsel Robert Mueller, according to House Oversight and Reform Committee Chairman Elijah Cummings. Still, notes ABC News Political Director Rick Klein, Cohen's testimony could be "a very big deal." "He has talked a lot," Klein tells us, "but he has never told his story under oath in front of Congress." Cohen was sentenced in December to three years in federal prison for financial crimes, lying to Congress and for two violations of campaign finance law in connection to hush-money payments to two women who've claimed having affairs with Trump. Cohen is scheduled to report to prison in early March. A new study has found that Americans are not having enough babies to replace themselves. According to a new National Vital statistics report, the country's fertility rate, at a 30-year low, is 16 percent below the threshold needed for repopulation. University of New Hampshire professor Kenneth Johnson, who wasn't involved in producing the report, says rates vary by state and demographics. 'This is not an apology: Alexandria Ocasio-Cortez fights back against actually fake news. 'It was said in very poor taste, and we won't tolerate that type of behavior': A high school basketball referee in Arizona is fired after asking whether a team's players had "their green cards." A supposedly fun thing they'll never do again: A seven-day Caribbean cruise is cut short when almost 300 people are infected with a norovirus, with one passenger telling ABC News: "At a cafe next to Guest Services last night, there was a kid vomiting in the trash can." Surf's up: Hey, everybody, it's Friday, you made it through the week ... so please enjoy this drone footage of a dude surfing with dolphins. The era of easy recycling may be coming to an end: Americans love convenient recycling, but convenient recycling increasingly does not love us. Waste experts call the system of dumping all the recyclables into one bin "single-stream recycling." It's popular. But the cost-benefit math of it has changed. The benefit -- more participation and thus more material put forward for recycling -- may have been overtaken by the cost -- unrecyclable recyclables. What the situation is like at the southern border now: As the government shutdown reaches day 21, "Nightline" goes to the border to see what the president calls an immigration "crisis." R. Kelly's lawyer speaks out as collaborators pull support for his client: Kelly is facing backlash after a recent Lifetime docuseries chronicled allegations of abuse against the singer -- and stars like Lady Gaga now are expressing regret about working with him. Jan. 11, 2018 -- The president of the United States of America says he doesn't want the U.S. to accept immigrants from "s---hole countries." Jayme Closs, a Wisconsin girl kidnapped after her parents were found murdered in their home, has been found alive.